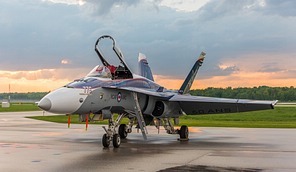 Ron Cembrowski looks back at the history of NORAD and provides a visual study of the NORAD 60th Anniversary paint scheme carried by the 2018 CF-18 Hornet Demo aircraft, as it arrived at Lake Simcoe Regional Airport, Ontario, for the 2018 Borden Air Show. Canada and the United States have had a close air defence partnership since the early days of WWII. Even though the United States was neutral at the time, in 1938 President Franklin D. Roosevelt promised support to Canada if it was ever threatened. By the summer of 1940 both Canada and the United States recognized that Canada could become the next target of Nazi Germany if the British Isles were to fall. As a result, President Franklin D. Roosevelt met with Canadian Prime Minister William Lyon Mackenzie King in August, near the border town of Ogdensburg, New York, to discuss the mutual defence of Canada and the United States. The discussion concluded with the signing of the Ogdensburg Agreement on August 18, 1940, and the establishment of the Permanent Joint Board on Defence (PJBD), a senior advisory committee with members from each country. 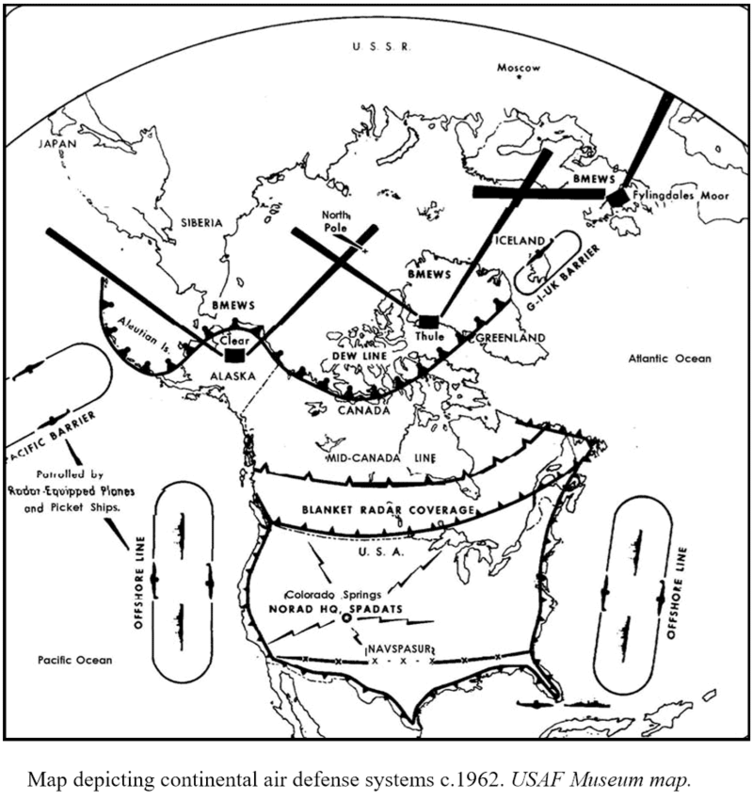 In 1949 a separate high-level Canada-US committee called the Military Cooperation Committee prepared an emergency plan for the common defence of North America and directed the air defence organizations of both countries to prepare the detailed defence plans. The first of these plans was issued in 1950. Defense agreements between Canada and the United States in the early 1950s focused on the construction of radar networks across Canada; the Pine Tree Line, the Mid-Canada Line and the Distant Early Warning Line (DEW). In 1954 the Canada-US Military Cooperation Committee authorized a combined planning group with members from the RCAF and USAF Air Defence Commands. It was this group that concluded that the best defence for North America was an integrated defence, with forces from both Canada and the United States under a single commander responsible to both governments. A second high-level joint group, the Military Study Group, made the same recommendation two years later. As a result, both governments agreed to the integrated operational control of air defence for Canada and the United States responsible to both countries’ Chiefs of Staff. On August 1, 1957, a joint announcement was made by the Canadian Minister of National Defence and the US Secretary of State. The agreement also stipulated the requirement for periodic review to ensure the command and its mandate could adapt to a changing environment. Originally called the North American Air Defence Command (NORAD), it became operational on an interim basis on September 12, 1957, until the official NORAD agreement was signed on May 12, 1958. The agreement also recognized that the Commander would be an American and the Deputy Commander would be a Canadian. NORAD was tasked with defending the continental US, Canada, and Alaska from attack, and was given the operational control over the air defence commands of both countries. This included the RCAF Air Defence Command (with 9 squadrons flying the CF-100 Canuck), the USAF Air Defense Command (flying the F-89 Scorpion, F-102 Delta Dagger, F-106 Dart), the US Naval Forces (flying the F4D Skyray) and the US Army Air Defense Command (with Nike SAMs). The CF-100 Canuck was retired from all-weather interceptor duty in the period 1961 – 1962 and by January 1962 the last NORAD CF-100 Squadron (413 Sqn) stood down to be replaced by the CF-101 Voodoo. Data from the Pinetree Line, Mid-Canada Line and DEW Line radar stations were processed through regional centres. This eventually included the use of Semi-Automatic Ground Environment (SAGE) data interpretation; a system of large computers and networking equipment design to produce a unified image of airspace over a large area. There were 23 SAGE Direction Centres, 22 located in the US and one in Canada at North Bay, Ontario. Construction on the underground facility at North Bay began in 1959 and the centre became operational on October 1, 1963. The radar sites of the Pinetree Line, which ran from Vancouver Island to Newfoundland just north of the Canadian border around the 50th parallel, had started to become obsolete by the late 1950s with the USSR developing faster jet powered bombers, thereby decreasing the warning time that these stations provided. Many of the sites were deactivated in the 1960s and 1970s, with some remaining operational into the 1980s on the Atlantic and Pacific Coasts. The Mid-Canada Line (MCL), also known as the “McGill Fence”, was built to supplement the less advanced Pinetree Line. It was a series of 98 radar stations, using Doppler radar, built east-west around the 55th parallel. It was designed to provide improved warning time to Pinetree Line Ground Controllers. However, from its inception the MCL was plagued with a technical problem that was never solved. Flocks of birds near a station could overwhelm and swamp a signal from a more distant aircraft. With the Soviet attack threat changing from bombers to Intercontinental Ballistic Missiles (ICBMs) it became apparent that the effectiveness of both the Pinetree Line and MCL were of limited use. The entire MCL was shutdown in April 1965. Even before the MCL became operational work began on the most northern and most capable of the three radar lines, the Distant Early Warning (DEW) line. Work began in December 1954. The line was built by the United States and consisted of over 50 radar (both Doppler and Long Range radars) and communication stations along the 70th parallel in the high Arctic. It stretched over 4800 km from the northwest coast of Alaska to the eastern shore of Baffin Island. On July 31, 1957, the DEW line was declared operational. During the 1960s and 1970s the USSR concentrated on the development of intercontinental and sea-launched ballistic missiles, which resulted in policy makers reassessing the effectiveness of the radar defence system. This evolving threat caused NORAD to expand its mission to include tactical warning and assessment of possible air, missile or space attacks on North America. The 1975 NORAD Agreement acknowledged this increase in NORAD Command’s mission, and in March 1981 the name was changed from the North American Air Defence Command (NORAD) to the North American Aerospace Defence Command (NORAD). On March 18, 1985, Prime Minister Brian Mulroney and President Ronald Reagan signed the North American Air Defence Modernization agreement in Quebec City. Its intent was to transition the DEW line to a new system called the North Warning System (NWS). In 1988 most of the DEW Stations were deactivated and a small number were upgraded with new equipment. The DEW Line was officially deactivated, and the NWS was officially activated, on July 15, 1993. The NWS consists of 15 long range radars, 11 of which are located in Canada (8 of these were previously DEW Line sites), and 39 short range surveillance radars of which 36 are located in Canada. They are situated along the entire Arctic Coast of North America and are tied in with other NORAD radars. The system runs from Alaska across Canada to Greenland forming a radar zone 4800 km long and 320 km wide. The NWS is operated and maintained by NORAD. The Alaska Regional Operations Control Center (ROCC) at Joint Base Elmendorf-Richardson, Alaska, controls the stations in Alaska. The Canada East and Canada West Regional Operations Control Centres (ROCCs) at 22 Wing, CFB North Bay, Ontario, control the stations in Canada. 22 Wing is also known as the Canadian Air Defence Sector (CADS). The surveillance and identification of all air traffic approaching North America (about 200,000 flights per year) is carried out 24/7 by personnel of 21 Aerospace Control and Warning Squadron (AC&WS) using radar information from the NWS, radars on the East and West coasts of Canada, and from Airborne Warning and Control System aircraft. 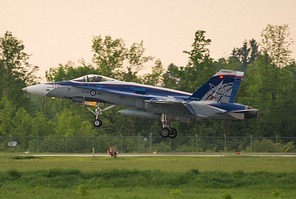 Unidentified aircraft, aircraft suspected of conducting illegal activities, or aircraft in distress would be intercepted by RCAF CF-188 Hornet fighters. Critical air sovereignty information is passed to the NORAD Combat Operations Centre (COC) at Colorado Springs, Colorado, where it would be given to the appropriate command authorities. In recognition of the changing threat environment following the September 11, 2001 terrorist attacks, on April 25, 2002, US President George W. Bush approved a new unified command called United States Northern Command (USNORTHCOM). The command became operational on October 1, 2002. USNORTHCOM’s mission is to protect, defend, and secure the United States and its interests within the assigned area of responsibility, together with its trusted partners. This includes land, sea and air approaches encompassing the contiguous United States, Alaska, Canada and Mexico and surrounding water out to approximately 500 nautical miles. The commander of USNORTHCOM is concurrently the commander of NORAD. USNORTHCOM HQ is co-located, with NORAD HQ, at Peterson AFB in Colorado Springs, CO. In 2006, NORAD continued to adapt to an ever-changing global threat. The central symbol of NORAD Command had always been the Cheyenne Mountain Operations Center (CMOC) which first became operational in 1966. This vast underground bunker located some 1500 feet under the granite mountain contained fifteen three story buildings. The facility was the central collection and coordination facility for NORAD’s global sensor systems. After various reviews and studies, it was decided that the CMOC surveillance and warning centres would be relocated to a dual-purpose command centre located at the NORAD and USNORTHCOM Command Centre at Peterson AFB. The Cheyenne Mountain Complex would no longer be maintained on a 24/7 basis and would become an alternate command centre. Alaska NORAD Region (ANR) headquartered at Joint Base Elmendorf-Richardson, AK. ANR conducts continuous surveillance and control of Alaskan airspace. Canadian NORAD Region (CANR) headquartered with 1 Canadian Air Division in Winnipeg, MB. CANR identifies and tracks all aircraft entering Canadian airspace and directs all air defence forces in Canada. 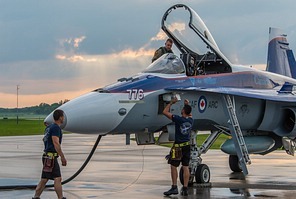 CANR maintains CF-188 aircraft on standby at 3 Wing Bagotville and 4 Wing Cold Lake, along with CC-130H(T) Hercules aircraft for air-to-air refuelling based at CFB Winnipeg. Continental US NORAD Region (CONR) headquartered at Tyndall AFB, FL. CONR directs the NORAD air sovereignty mission for the continental United States. 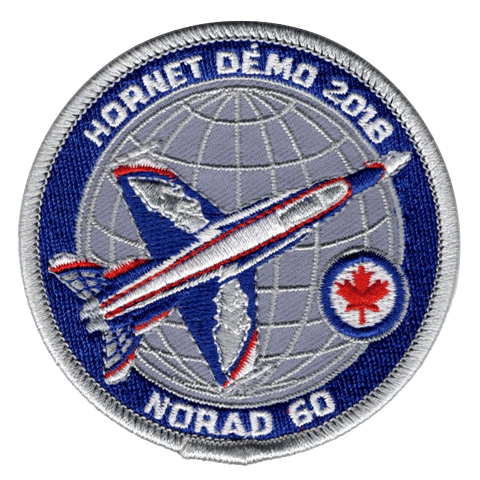 2018 marks the 60th Anniversary of NORAD (1958 – 2018). 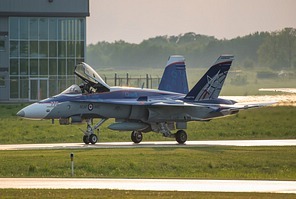 The 2018 CF-18 Demonstration Hornet (CF-188 188776) was unveiled in the Aerospace Engineering and Test Establishment (AETE) hangar, at CFB Cold Lake, on Tuesday, April 3, 2018. 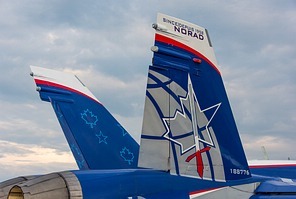 The special paint scheme celebrates the 60th anniversary of NORAD. The scheme was designed by Capt. Jeff Chester, who is an RCAF reservist. 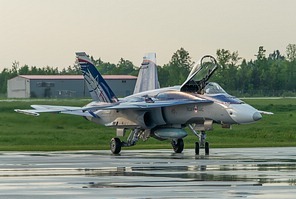 Jim Belliveau, who has designed numerous commemorative paint schemes on previous CF-18 Demonstration Team Hornets as well as other RCAF aircraft, acted as the creative design consultant. The design is based around the NORAD crest using the main features of the globe, wings, sword, and lightning bolts with the addition of a composite American Star and Canadian Maple Leaf. 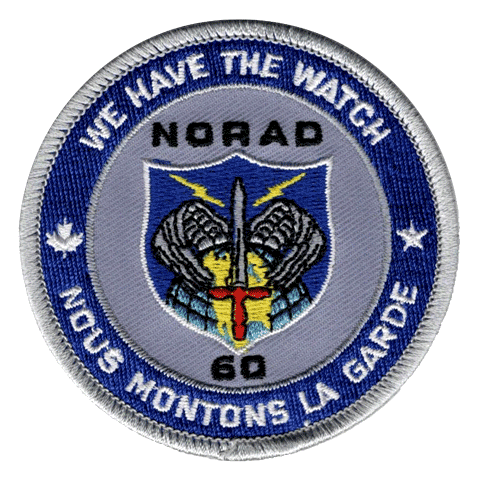 The NORAD motto “WE HAVE THE WATCH” is painted in both English and French on the aircraft upper wing control surfaces and “60 Years” on the lower surfaces. The lightning bolts appear on the upper left and right fuselage/Leading Edge Extension. The aircraft is painted in the national red and white colours of Canada and the national red, white and blue colours of the United States. The CF-18 Demonstration Team performed at 26 different locations during the 2018 air show season, from May to October. The 2018 CF-18 Demonstration Team pilot is Captain Stephan Porteous. Capt. Porteous was born and raised in Comox, British Columbia. He joined the RCAF in 2008 and continued to work in support of the Royal Canadian Air Cadets during his summers. Upon graduating from university in 2010, Capt. Porteous was posted to 4 Wing Cold Lake, AB for on-the-job training. Capt. Porteous began his flight training in the summer of 2010 at 3 Canadian Forces Flying Training School (3 CFFTS) in Portage-la-Prairie, MB. He completed his training in 2011 at 2 Canadian Forces Flying Training School (2 CFFTS) in Moose Jaw, SK. In 2012, he was selected to fly jets and received his pilot wings in 2013 on the CT-155 Hawk aircraft. Captain Porteous graduated from 410 Tactical Fighter (Operational Training) Squadron in Cold Lake, AB, on the CF-188 Hornet in 2014. Today, Captain Porteous is a skilled RCAF pilot with combat experience and has trained across Canada and the United States. He is currently with 433 Tactical Fighter Squadron at 3 Wing Bagotville, QC. 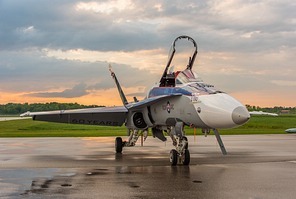 The photos used in this report were taken on Thursday May 31, 2018 at Lake Simcoe Regional Airport (CYLS), Ontario, during the 2018 Borden Air Show media day. 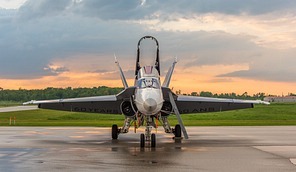 A special thanks for the airport access, as well as their kind assistance, is owed to Lt (Navy) Christine Hurov, CFB Borden Public Affairs Officer, and to Capt Jennifer Howell, CF-18 Demo Team Public Affairs Officer.